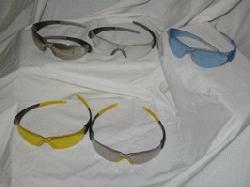 Get maximum style and protection at minimum cost with Crews new trend-setting safety glasses. The super-lightweight CK2 provides near total eye orbital seal and features flexible bayonet temples, gel temple sleeves and universal gel nose bridge, ensuring compliance and comfort for a variety of wearers. Clip-on breakaway cord optional.